The Fan Favorite from last week is this adorable FREE printable from Meeha Meeha. I love the colors...so pretty! Hurry over and get your copy! I just love this Twine Bowl DIY from Creekline House. How creative! And wouldn't this make a FABULOUS gift?? I love this fresh and pretty living room tour from A Lived in Home. The colors and...those windows...are just lovely! 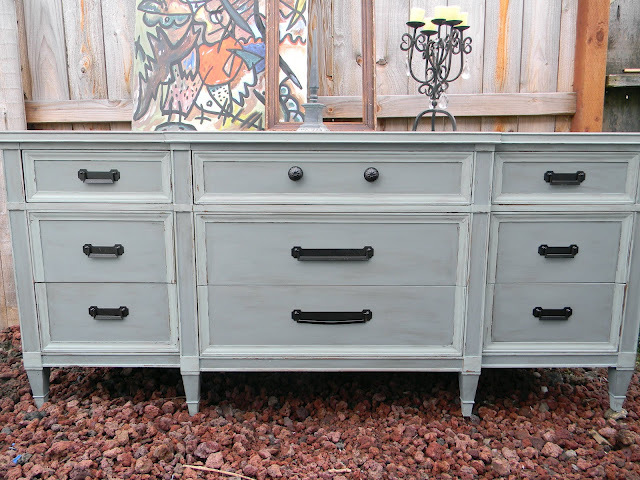 And last but not least, I loved this dresser redo by Emily's Up-cycled Furniture. She really gave this old piece some personality! Thank you so much for hosting the party. I love the twine bowl you featured! That dresser is gorgeous. Great choices. Thanks for the party once again. Love the features!! I espeically love the living room!! Such great color choices & the curtains look great! Thanks so much for hosting the party! Thanks for featuring my dresser, Im glad you liked it. That twine bowl is amazing...thanks for the party! Thank you for the feature, I am honored and happy and totally surprised to have such a popular link! Thanks for hosting!! I hope you have a wonderful weekend!! I love the living room you featured! My living room is painted the same way, and I love the furniture and curtains she coordinated with it! I'm linking up some ceramic tile coasters this week. Thank you so much for hosting! Hello and good morning! There are mean, bitty ants taking up residence in my garden. I wanted to get rid of the pests without icky chemical sprays. I'm sharing a simple recipe for Ant Deterrent. It works great and is simple to make. Thanks for hosting the party once again. Have a great week! Thanks for hosting - your features are fantastic this week! Love those features! Have a great weekend! Love the features this week! Especially that dresser! Gorgeous!! Thank you for hosting. New follower and linker. Okay don't laugh but when I linked in, I uploaded the wrong photo! So sorry :( I am still new to this linking up stuff. But thank you so much for the opportunity. Thanks for hosting! I linked up #378. I host my own party on Thursdays. You should pass by and check it out! Have a great weekend! Thanks for hosting for another great week of posts. I'm #397, and my favorite so far (I have got to go fix supper!) is the creamy white vignette #32. Thanks so much for featuring my living room and for hosting. I'm always linking up here! Thank you for hosting! I linked up a little rustic honey bee favor. Beautiful features!